Among the problems faced by rapidly urbanizing cities is how to efficiently manage the growing volume of waste and safeguard public health and quality of life. Photo credit: ADB. 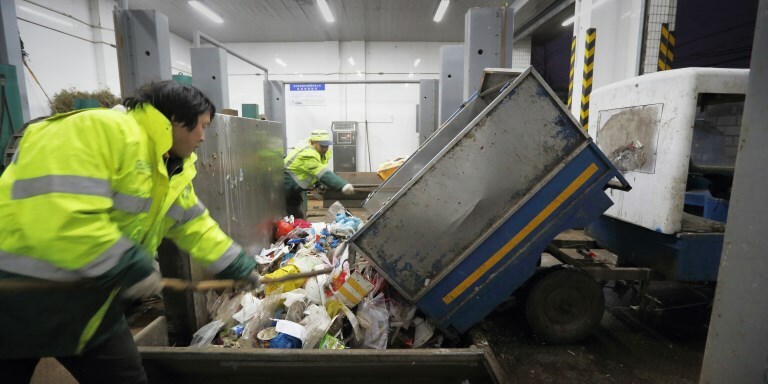 The Republic of Korea’s Sudokwon Landfill, one of the largest in the world, offers a sustainable model for urban waste management. The Sudokwon Landfill is a world-class waste treatment facility that follows best practices in waste management and uses some of the latest smart technologies in the sector. The 2,000-hectare complex in Incheon city can treat 18,000 tons of waste every day. This case study is based on learning materials from the Asian Development Bank’s exposure and study visit, Sharing Successful Implementation and Best Practices of Smart Cities on Water and Solid Waste Management. The visit to the Republic of Korea was organized for officials of the Government of India in support of its “100 Smart Cities Mission,” which aims to transform a hundred cities into people-friendly and sustainable urban centers. It included a guided tour of the Sudokwon Landfill and its facilities. The Sudokwon Landfill Site Management Corporation, which has been managing the landfill for more than 15 years, offered technical, institutional, regulatory, financial, and technological expertise to the visiting Indian delegation. About 90% of waste in India is disposed through open dumping, a problem that many rapidly urbanizing cities face. Best practices and smart technologies in solid waste management, such as those used by Sudokwon Landfill, can help to improve the quality of life in these cities. In the 1970s, waste management became a critical urban issue in the greater Seoul metropolitan area. The increasing volume of garbage was driven by the booming manufacturing industry, industrialization, and mass consumption. Not even the numerous landfills in the outskirts of the city could accommodate the daily volume of trash. The Sudokwon Landfill Site Management Corporation was set up in 2000 to operate the Sudokwon Landfill, one of the largest in the world. The company follows globally recognized best practices in waste management. About 15 tons of waste produced daily by the 25 million residents in the metropolitan area of Seoul, Incheon, and Gyeonggi-do are collected and transported to the Sudokwon Landfill for treatment. The waste in the landfill is covered with soil to minimize exposure, reduce stench, block landfill gas, and reduce the occurrence of leachate. Leachate, the liquid that drains from the landfill, is treated at a treatment facility before being discharged for other uses or released back into the environment to prevent groundwater pollution. The company is working on a zero-leachate discharge system to eliminate the smallest risk of water pollution. The Sudokwon Landfill also houses one of the world’s largest landfill gas power plant that converts gas from waste into electricity. The power plant generates about $50 million worth of electricity annually, enough to provide electricity to 440,000 residents. About 500 tons of food waste is also converted daily into renewable energy at a biogas plant. When mixed with compressed natural gas, the biogas produced by the plant can fuel about 81,131 buses per year. The company has also embarked on a pilot project to produce solid fuel from sludge and combustible waste to minimize burning or incineration, which contributes to greenhouse gas emissions. Sudokwon Landfill Site Management Corporation is converting used landfill sites under its Dreampark project to provide a place for relaxation and for learning about nature and sustainable waste management. The eco-park features the Green-Bio Complex, a vast expanse of tree and flower gardens with nature and wetlands observation facilities, and a sports complex. The company also partners with local communities to promote community welfare and development. Initiatives include community briefings to provide information on landfill operations and opportunities for cooperation, the creation of the Sudokwon Landfill Community Council to oversee community affairs, and the establishment of the Dreampark Volunteer Organization, which conducts social welfare activities. In 2004, the company established the Dreampark Scholarship Foundation for residents and children of employees. Sudokwon’s first landfill has been completely reclaimed and converted into a sports park with a trekking course, a sports complex, playground, and a public golf course. Meanwhile, work on managing and transforming three other landfills are ongoing. Since 2004, the Dreampark has hosted artistic and cultural events, including the annual Dreampark Chrysanthemum and Wild Flower Festivals, which has attracted domestic and international tourists. It has an operating cost of about $18 million, 264 staff, and annual revenues of about $19 million. Sudokwon Landfill has contributed to mitigating the effects of climate change as an emission-reduction project under the Clean Development Mechanism of the United Nations. It has obtained certified emissions reduction (CER) credits equivalent to about 800,000 carbon dioxide tons annually. The Dreampark Scholarship Foundation has awarded a total of 379 scholarships since 2004. The Sudokwon Landfill offers smart technology solutions and best practices that can be adopted by landfills in India and other countries. The company began with a clear vision of the landfill in the future, the Dreampark, and is working toward achieving that vision by following environment-friendly landfill management processes. Covering waste with soil is the crucial first step as it prevents air and water pollution. In the Sudokwon Landfill, soil covering is a continuous process that begins with the immediate and daily covering of freshly dumped waste. Intermediate covering and final soil covering, which involves many layers, ensures that the landfill is environmentally safe. Landfill projects offer opportunities to discover solutions to climate change. The company continues to find new and innovative ways of managing the landfill. Its pilot mechanical biological treatment facilities and biogas plants contribute to minimizing the impacts of climate change. By working with local communities, the company has gained partners not only in changing people’s mindsets about landfills, but also in making the Dreampark sustainable. Sudokwon Landfill Site Management Corporation. 2017. Sudokwon Landfill Site Management. A video presentation at the exposure and study visit, Sharing Successful Implementation and Best Practices of Smart Cities on Water and Solid Waste Management. Incheon, Republic of Korea. Jaemin Nam has 20 years of professional experience in urban development, water, and hydropower. At K-water, he led projects in Southeast Asia, the Middle East, and Africa. Since joining ADB, he has been engaged in more than 20 projects as a financial management specialist and has led the regional technical assistance project on promoting smart water management.